double-acting. The force of the piston rod thus acts in one or in both directions on the axle. This means that the cylinder can be used to generate a pushing force or a pulling force. The use of compressed air can lead to jerky movements and vibrations.n. distributing pockets in the sliding surface. This guarantees the appropriate distribution of lubricant over the entire service life. its extreme stress potential and distinct damping characteristic, the P20 constantly maintains its function as a precise spigot bearing. KS PERMAGLIDE® P20 is a low-maintenance, leaded bearing material with a high performance. It is designed for greaselubricated or liquid-lubricated applications. This composite, multi-layered material excels through its high rigidity, durability and resistance to oscillation and vibration. distributing pockets as per DIN ISO 3547.
installation dimensions. Also available are versions with a different wall thickness, suitable for rework when installed, or with a smooth sliding surface for hydrodynamic applications. piston rod. 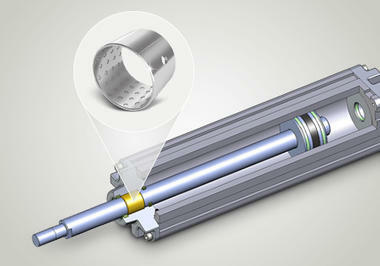 Single-acting cylinders are usually also equipped with a return spring. The material P20 contains lead and must not be used in the food sector. The material P200 (unleaded) can be used in the food sector. We will be happy to draw up an offer for your application.